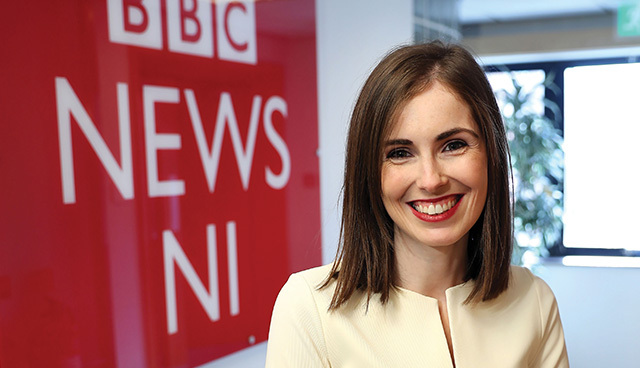 Business journalist at BBC NI, Clodagh Rice, discusses getting a break in the industry, working across multi-platforms and the value of learning from colleagues on a daily basis. I wanted to be a journalist from a young age but had no idea how to make it happen. While studying at Trinity College, Dublin I was involved with student radio and newspapers. After graduating, I did work experience at lots of media organisations but found it difficult to make the transition to paid work so I decided to study a Master’s degree in Journalism at University of Ulster. My work experience meant I had built up a network of contacts for freelance opportunities. My alarm goes off at 4.30am every day but that’s probably the only part of my working day that is always the same. As the Business Reporter on Good Morning Ulster, I’m on air from 0630-0900 every morning with a mixture of live interviews and breaking stories. Where possible, I like getting out of the studio doing outside broadcasts from events and venues. Different stories warrant different levels of coverage, so depending on the story, I can also provide digital content for the BBC News NI website and TV output for BBC Newsline. I work with many reporters with years of experience and I learn from them on a daily basis. It wouldn’t be fair to single one person out because I see how hard they all work. Some examples include John Campbell, Marie Louise Connolly and Mark Devenport who have extremely challenging workloads that they deal with in a very professional manner. Others like Colletta Smith and Chris Buckler have gone on to have great success outside Northern Ireland within the BBC. I like hearing people tell their own stories. Quite often when interviewing someone about their business, finding out their background and some of the challenges they are facing is the more interesting story. I also enjoy the variety that comes with the job and working to deadlines. I’m not sure what my most notable story would be – the ‘biggest name’ I have interviewed is Boris Johnson on a visit to Northern Ireland. One of my favourite projects I worked on was Good Morning Ulster’s outside broadcast from Belcoo at the Irish border. We were talking about Brexit and heard from lots of people who are going to be the most affected by leaving the EU who had never been interviewed before. It took lots of planning but the interviewees were very strong and it was a really worthwhile experience. The digital revolution is a big challenge for journalists as it means the news cycle doesn’t stop, but there is a huge audience online who are constantly looking for content. Social media is an important tool for journalists as there is so much noise on social media that I think it is the responsibility of journalists to be a trusted source of information online. Stick at it and don’t be afraid to ask for help. It can be frustrating starting out as there is no clear route into journalism. I’m very lucky to have been helped by reporters like Barbara McCann, Brian Rowan and Brendan Wright. While journalists are often busy, they are important people to learn from. It’s also important to talk to people when you’re out and about – you never know who might end up being a good source! When I’m not in work I enjoy travelling, whether to a country I’ve never been to before or to different parts of Northern Ireland. I like pretending to be a tourist even if the activities are on my doorstep. I have also taken up ballet (which was daunting after a break of almost 20 years!) and I enjoy spending time with my friends, eating out and a nice glass of red wine.